Square front vertical frame with straight shelves. Use when picking full cases such as canned goods or wine. 10 degree layback vertical frame with straight shelves. Use these to pick from open cases that vary in size. Example: health & beauty aids. 10 degree layback vertical frame with carton tilt shelves are used when picking from open cases, if the cases are similar size. This can include liquor and paperback books. Gravity Flow Rack Styles - what can you store, and what should you store it in? Handle the medium to fast moving items -- typically about 90% of the goods in most systems. Accommodate very slow movers and odd shapes, usually about 5% of the total. These shelves can fit within bays or attach to the outside at the ends of each row to keep goods close to their normal picking sequence. 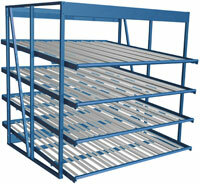 Static and gravity flow shelves are interchangeable for easy rearrangement at any time. In one, two, or three levels enables utilization of all available storage space. Immediate replenishment of fastest movers, no time is lost waiting for reserves to be brought from other storage areas. Single and double-width pallet bays make it possible to handle the full range of pallet sizes. For the fastest-moving items, usually 5%. They normally hold two pallets in a single bay. As with carton flow, the pallets move by gravity from the restock side to the picking position. Empty pallets are returned to the restocking aisle through the return shelf. Use flow rail rack when the average order consists of multiple items, but only a few pieces per item. The rack system should be deep enough to hold a 3-5 day supply of the average item. For faster moving items, assign more than one lane or restock more often. Pick items which are ordered in large quantities from a pallet flow lane (usually 5% of the line). Place extremely slow movers (usually 5% of the total line) on static shelves. Use gravity flow shelves for split case or full case picking. Use standard straight shelves and standard square front vertical shelves when picking full cases. Use flow rail systems to handle any weight package you can comfortably lift.